I had just spewed vomit across the floor of the nicest bathroom I'd ever seen. With its slate floors, recessed lighting, and scented hand towels individually rolled up in a marble box next to the sink, it looked like a spa advertisement you'd find in a glossy magazine with the really expensive thick paper. A hologram of a zebra appeared on the smoky mirror when you turned on the faucet, then disappeared again when the water stopped running. It had the feel of somewhere you would enjoy a glass of Dom Perignon, rather than somewhere to relieve yourself—or spend an hour puking. Immediately inside le Savoy, the bar at the base of France's Meribel where I'd come to après with a handful of journalists, I got the feeling they didn't serve PBR tall boys. Still in my helmet, jacket, and ski pants, I was directed to take a seat in a row of plush chairs where a young hostess helped me out of my ski boots, offered me a pair of house slippers, and escorted me to a private backroom. I was suddenly painfully aware of my matted hair and wind-burned lips. Surely the staff could sense I had no business being somewhere as upscale as their bar. I proved them right when I bolted from the table filled with fine French wines, meats and cheeses, scrambling to find the bathroom I was now locked inside; my skin clammy and warm, my temples pulsating with a sharp and nauseating headache. Day two of a five-day trip through Les Trois Vallées had showed up with luminous cobalt skies and 10 inches of new snow on top of the almost two feet that had fallen the week before. When I walked into the bar an hour before, my body was instead pounding with the explosive rhythm of adrenaline—the result of an all-time deep powder day in the French Alps. Day two of a five-day trip through Les Trois Vallées had showed up with luminous cobalt skies and 10 inches of new snow on top of the almost two feet that had fallen the week before. In the two weeks before I arrived, it had snowed 71 inches. 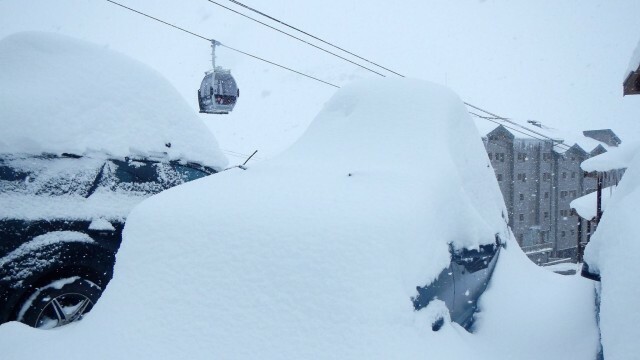 Winter had finally arrived in the Alps. 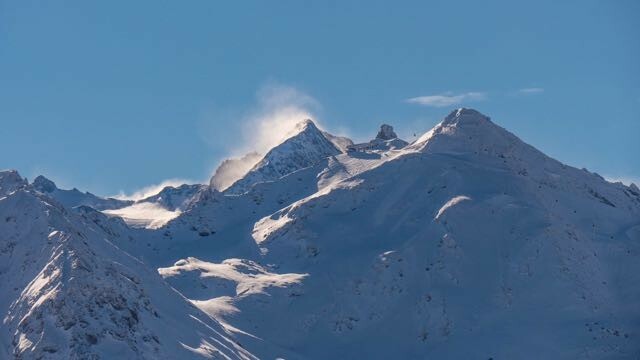 Meribel's towering limestone peaks shimmered an icy blue under the high alpine sun—a welcome reprieve after the previous day's whiteout at neighboring Val Thorens, where low light and a fourth consecutive day of falling snow had eliminated all visibility. The horizon had disappeared, erasing all points of reference; it was dizzying. I could hardly see the tips of my skis, let alone the sprawling expanse of the mountains before me. I was wholly dependent on our guide Bengat—a salty young Frenchman with a five-o’-clock shadow and a gold hoop earing—to lead me through the white abyss. Blind to our surroundings, we chattered down along the choppy edges of a corduroy trail that weaved its way back and forth across the low-angle bowl under the high-speed Plein Sud chairlift. The light was so flat it was impossible to see any variations in the terrain. Two feet of untouched powder flanked either side of the path, begging to be skied. But thanks to unmarked and invisible cliffs, Bengat steered us away from the goods. His direction felt torturous, though after unintentionally skiing off the edge of the trail and into a ravine earlier that morning, I was inclined to heed the guide's warning. Slowly and cautiously, we covered most of Val Thorens' front side before late afternoon when finally the clouds shifted, visibility improved, and we ripped through unskied powder under the Peclet Gondola. We carved deep powder turns, weaving in and out of each others’ tracks, kicking up enough light, dry powder to cloud visibility almost as it had been that morning. Equally as charming was our mountain guide, Marie Laissus, a charismatic local woman in her late 30’s born to ski instructor parents and raised skiing in Les Trois Vallées. She skied through Meribel's deep powder fields, her shoulder length brunette hair blowing out from her white knit hat as she wove on and off piste with such incredible speed and a strong, graceful stance. It surprised me to learn Laissus picked up a snowboard in her teens and found a place on the French national team, competing in snowboard cross at the X Games, seven world cups, and ultimately winning two world championships. My thighs burned as I hustled to follow her lead. The day was fast and deep. We lapped empty trails of barely-tracked powder, dipping into the trees and flying over steep rollers. We crested a ledge above a pristine face of deep snow unfolding below us. Flashing a bright white smile over her shoulder, Laissus dropped over without hesitation. We followed; pillows of powder pelting our chests while we let out half laughter, half hollers until the trail flattened out before the gondola line. We loaded into the Mont Vallon gondola, climbing to 10,597 feet where the summit provided a view of the Gibroulaz Glacier and miles of backcountry terrain. I struggled to catch my breath—partially due to the view, but mostly the elevation. By the time I walked into le Savoy in the village that evening, I was starting to feel the effects of going from sea level to above 10,000 feet in 48 hours. Coupled with the jetlag of a 12-hour flight from Los Angeles to Paris and on to Lyon, my body was revolting. Which was how I found myself in the ornate bathroom with the slate floors and the zebra mirror in a place where the bartender mixes your cocktails based on an assessment of your personality. With nowhere to pull over on the winding mountain road, our driver gave me the go-ahead to roll down the window and throw up two or three times; most of it freezing to the side of the van. Pale, exhausted, and embarrassed, I rode in the front seat of a van we'd hired for the 90-minute ride back to our accommodations at Club Med Val Thorens. With nowhere to pull over on the winding mountain road, our driver gave me the go-ahead to roll down the window and throw up two or three times, most of it freezing to the side of the van. I saw him chipping it off with an ice scraper when he dropped us off, and my last bit of dignity crumbled. By morning, I'd squeezed out maybe three hours of sleep, while an overnight storm squeezed out four more inches of snow. 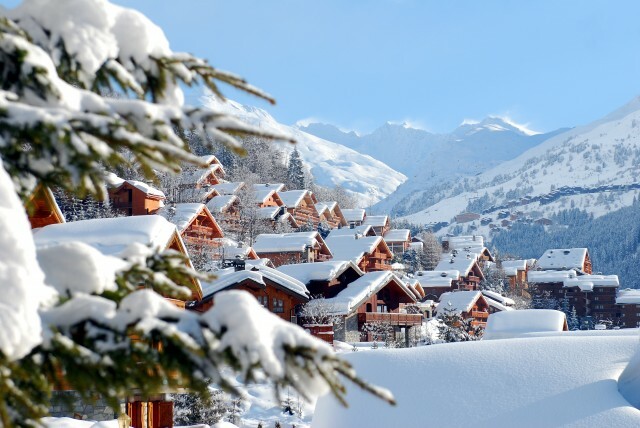 We planned to ski Courchevel that day, a magical winter fairyland frequented by Saudi royals, William and Kate, and the Beckhams, and the third of the three linked resorts of Les Trois Vallées. Despite the blue skies we skied under just the day before, the clouds had rolled back into the valley, blocking the famed view of Mont Blanc. Heavy, enormous snowflakes continued to fall throughout the day and light was sparse. Still queasy from the night before, vertigo set in quickly. I'd link four or five turns, knees loose in anticipation of unseen changes in the snow, then stop to sit on the slope until the nausea passed. Courchevel, arguably the most luxurious resort in the Alps known for its shady couloirs at the top of the Saulire cable car and some of the steepest pistes in Europe, sits almost 2,000 feet lower than Val Thorens; my body thanked me. By noon, my legs stopped shaking and there was color in my face. I had rallied for the ski from Val Thorens to here, but had to forgo attempts to explore through Courchevel's extensive off-piste terrain. Knowing even a crummy day on skis is better than the best day without them, I cruised rolling groomers to the Narnia-like village below. As the sun dipped behind the peaks on our last day in France, the snow kept coming, even after the last chair stopped. Air Frances flies direct to Paris from most major cities. From there, it’s a short flight to Lyon where Club Med sent a driver to take me directly to the resort. It’s a long, winding, and beautiful road though the French countryside and up, up, and still more up, into the Alps. When I think of all-inclusive resorts, I think white sand beaches and tiki drinks. Not so at Club Med Val Thorens—one of the resorts numerous alpine destinations. Eat, drink, play and ski all in one. Treat yo’self. Anything and everything you can, seriously. A word of warning, even on a powder day, expect lunch to last several hours…and include a few glasses of wine. A few favorites: Le Yeti (ski-in, ski-out at Meribel) and in Val Thorens, Jean Sulpice, perhaps the only 2 Michelin-star restaurant where it’s okay to dine in your base layers.